LNT-Aid 2018 is Gonna Rock! 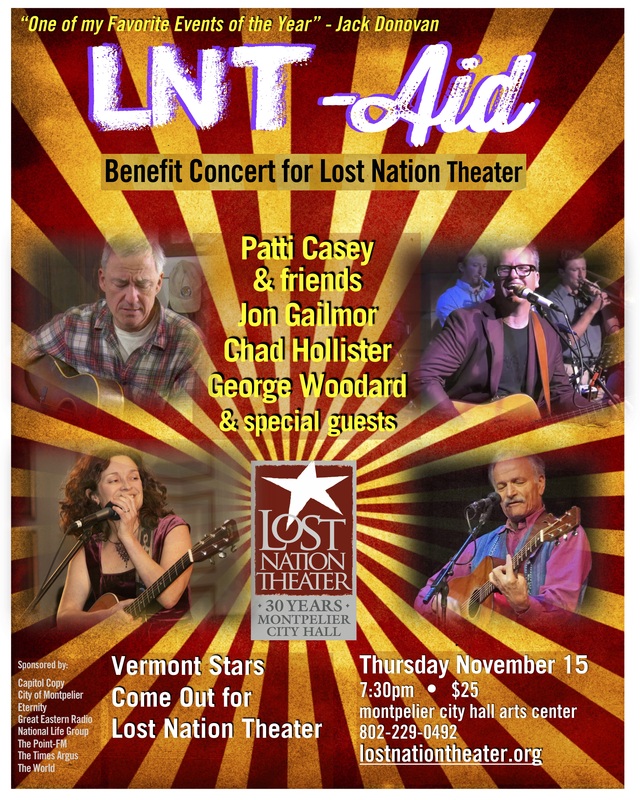 – one of the Vermont All-Star performers who are banding together on Thursday November 15 for the 5th Annual LNT-Aid: a benefit concert for Lost Nation Theater. 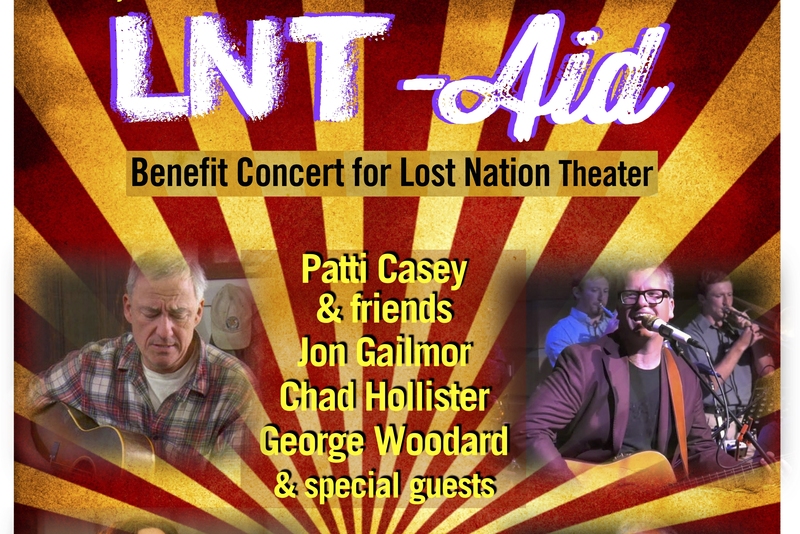 A mega concert with mega-talented artists doing their remarkable things to raise much-needed funds for Lost Nation Theater, LNT-Aid means great tunes, great laughs, and great storytelling! All for a great cause. - and rascally raconteur George Woodard. Soundman Bennett Shapiro of MadTech Sound provides the audio engineering – so you know it will sound great! Your Emcee for the evening: the inimitable Rick Ames! Special surprise guests - like LNT's Producing Artistic Director Kathleen Keenan - will join the evening. “Chad Hollister is a no-frills kind of rocker cast from the same mold as such classic-American artists as Bruce Springsteen, Tom Petty and John Mellencamp.” - Billboard Magazine. Jon Gailmor is hailed as “Genius” – and what can be said about George Woodard!! The inaugural benefit concert was a smash – and since LNT needs cold, hard cash to help ensure the company survives the Winter – the magical concert LNT-Aid is back. Come be part of this miracle concert: LNT-Aid! Who knows what unscripted things you might experience thanks to Patti, Jon, Chad, George, and Bennett of Mad Tech Sound! Thanks to Capitol Grounds, Morse Farm and others, tasty treats and a cash bar will also be available. LNT-Aid! See it! Thursday, November 15 at 7:30pm. All tickets are $25. For tickets & information: call 802-229-0492, or Click Here! You can also purchase tickets at the Montpelier City Clerks Office (1st floor City Hall) or at the door (as available). City Hall Arts Center (39 Main Street, Montpelier) is wheel chair accessible. LNT offers assisted listening and large print programs. Service dogs always welcome. Inform the box office of any special needs when purchasing tickets. Lost Nation Theater, named “One of the Best Regional Theaters in America” by the New York City Drama League is underwritten by Capitol Copy, The City of Montpelier, National Life Group, The Times Argus, Great Eastern Radio, and The Point! With additional support from Capitol Grounds, Capitol Stationers, Eternity, WDEV and The World.